An abandoned dog had just given birth to three puppies and had to be spayed. So, one animal shelter employee climbed into her cage to comfort her. Prissy is a 4-year-old hound mix who was abandoned in a junkyard along with her three puppies in Tennessee. After undergoing surgery to be spayed, Prissy, like many dogs awaking from anesthesia, "was having a tough time," explains Virginia Moore, the executive director of the Conway Area Humane Society in New Hampshire. 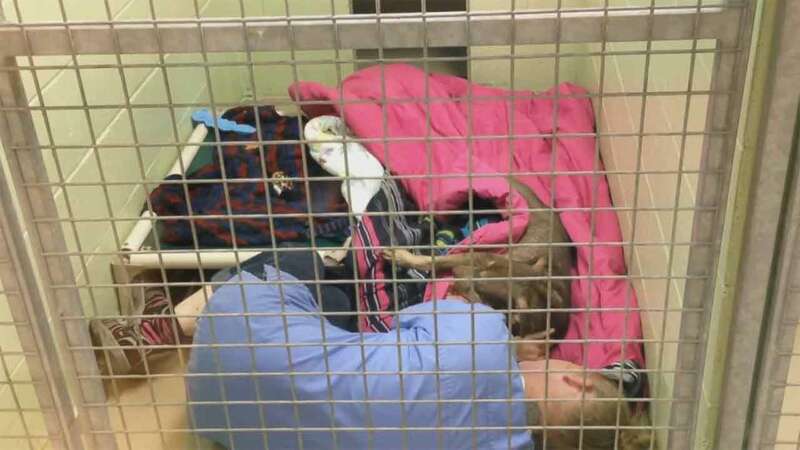 Moore tells ABC News, "Chrissy [Ireland], our kennel supervisor, didn't want her to wake up alone." Moore added that Ireland decided to get into the cage, lay down and cuddle Prissy to ease her fears. Ireland had no idea that her coworker Debra Cameron would catch her in a now-viral Facebook video. She says she was just doing her job. "I saw [Prissy] and she was all shaky and she didn't feel good," Ireland recalled. "It made me feel so sad for her. So I just found myself laying on the floor with her and kissing her and loving her.